Currently stored in an undercover yacht showroom in Fort Lauderdale. Seller will be open to trades of smaller boats. This 68' Symbol Motor Yacht DREAM GIRL was designed by renowned naval architect Jack Sarin, well known as designer of Westport Yachts, West Bay SonShip, Crescent and other large motor yachts. This Symbol was designed for the owner operator, large enough for extended cruising but small enough for a couple to handle without crew. Built with three cabins, all with en-suiteheads, plus a day head in the salon, a large back deck, walk around side decks, and a great entertainment area on the flybridge makes this a well-rounded cruiser. United Yacht Sales New Jersey would love to guide you through a personal showing of this 68' Symbol 2005. 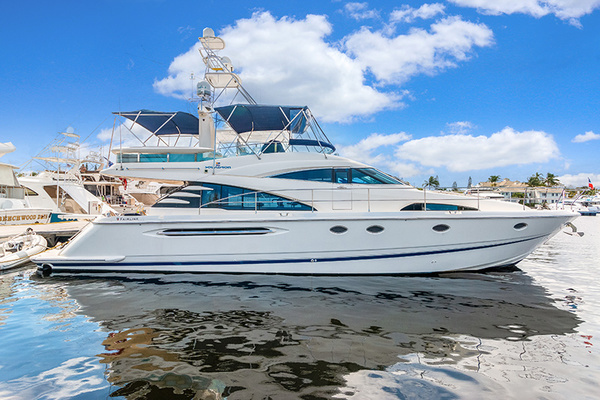 This yacht for sale is located in Fort Lauderdale, Florida and priced at $899,500. For a showing please contact us by filling out the form on this page and we will get back to you shortly! Entrance to the salon is from a glass and stainless sliding door from the cockpit. Immediately to port is a day head, typical for Symbol Yachts, but unusual in most other cruisers in this size. The interior woodwork is satin finish cherry with very large windows. The lower edges of the windows are at a height that allows guests seated inside to see out to the water, not just to the sky. The furniture inside is not fixed or built in, the couch, coffee table, chairs and dining table can be kept the way they are or all can be changed to the new owner’s tastes. To port is an entertainment center with a flat screen satellite television on a lift to be hidden away when not in use. A few steps up from the salon leads into the pilothouse and galley. The “U” shaped galley is to the starboard side with brown granite counters and back splash. The Sub Zero refrigerator with two freezer drawers below has the same wood doors as the rest of the galley; the floors are teak and holly. The cabinet doors are all louvered for ventilation. Over the ceramic cook top is an opening looking into the main salon. The sink is double stainless steel. The pilothouse has been designed for full operation of the vessel with good visibility from two Stidd helm seats. The helm has a full array of electronic navigation and engine displays. There are watertight Pantograph style doors to each side for access to side decks and the bow. Generator monitors along with shore power and ships powers selectors are on a panel here, easily checked from the helm. The navigation electronics are impressive but there is a radar antenna unit that was improperly installed when the boat was new. It was mounted between the two satellite domes for television and Sat phone under an aluminum arch. The transmit signal cannot get through the metal parts to show targets to the sides of the boat. No previous owner has thought it important enough to move it 22 inches higher to the top of that same aluminum arch to get a clear signal. Access to the staterooms is from a curving staircase in the pilothouse leading to a foyer with a separate stacked washer and dryer. As with most boats built in Taiwan, the interior woodwork is what sets these boats apart from European and American builders. Symbol has done a spectacular job on the interior woodwork with matched grains, trim work, curved rails and fiddles, curved door frames, louvered doors, wooden air conditioning vents instead of metal, and all the carpentry touches that are too expensive to build in the US. In addition to the washer dryer in this area, the stairs to the forward stateroom lift to reveal a storage and equipment compartment for access to shower sumps, the Trace inverter, thru hull fittings, and room to store bins and baskets and boxes of extra provisions and spare parts.The master cabin is midship and full beam with a king size center-linewalk around berth with night tables to either side. There is storage below the berth and many cabinets, drawers and closets to allow time for on board for extended cruising. The en-suitehead has an oversize enclosed stall shower, granite counter tops, recessed sink, and large mirror.The VIP stateroom is forward with center-linequeen berth with storage below, a hanging locker, an opening hatch for light and fresh air, and an en suitehead with granite counters and stall shower.The third stateroom has upper and lower bunk berths, sometimes referred to as the Grandchildren’s cabin; this stateroom also has an en suitehead with stall shower and the same granite counter top.All cabins have individual satellite receivers for the televisions. The teak covered aft deck is shaded from the sun all the way to the transom. Rather than built in bench seating it was designed to be more flexible with tables and chairs to be picked by the boat owner and moved as they see fit. There is a remote docking station here in a closed compartment with engine and throttle controls and bow and stern thruster controls. An electrically operated hatch gives access to the lazarette for storage. It also provides access to steering, stern thruster, trim tabs and Glendenning Cable master and more. Stored here is a seven step Marquipt Sea Stairs boarding stair, the type that always have the steps level, even as the tide goes up and down.There is a door in the transom rather than only a gate, leading to the teak covered swim platform. Mounted on the platform is the hydraulic dinghy davit so that the tender does not take room away from the flybridge entertaining area. There is no dinghy included.The boat was built with full walk around side decks so line handling when docking is so much easier. The teak covered side decks are covered at the main salon, helping to keep out the strong sun so the window shades in the salon need not always be down. There are side doors from the aft deck for boarding, plus gates in the stainless rail forward if the dock is much higher. Forward at the bow are the decks are non-skid, there is a sun pad over the forward cabin area. There is a Muir electric windlass here with foot controls and a water wash down for a muddy anchor. The chain and rope lockers a have room for more fender storage. The engine room is accessed from the cockpit via a concealed door in the staircase to the Flybridge. Full stand-up with good access throughout. The engine room is dressed in white, perforated aluminum surface with foam/lead sound shielding behind it. Engines are mounted on one-piece polished stainless steel beds. (2) 600 gallon fiberglass fuel tanks run athwartships forward in the engine room for superior balance (connected via hose w/ball valves, sight gauges, distribution manifold).